To carry the vibrant spirit of "Fantastic Baby" with me everywhere, I painted my nails with Big Bang's faces. Watch the tutorial below and carry the spirit with me! My dude friend liked my nails so much he posted it on his Instagram! I feel so special. Usually guys don't notice the effort girls put into their nails. Nails inspired by Kara's "Pandora"
Parody of 2NE1's "I Am the Best"
2:39 am. Late Thursday night, early Friday morning. My best friend and I arrive in Hongdae after dinner at Bonjour Restaurant & Cafe. 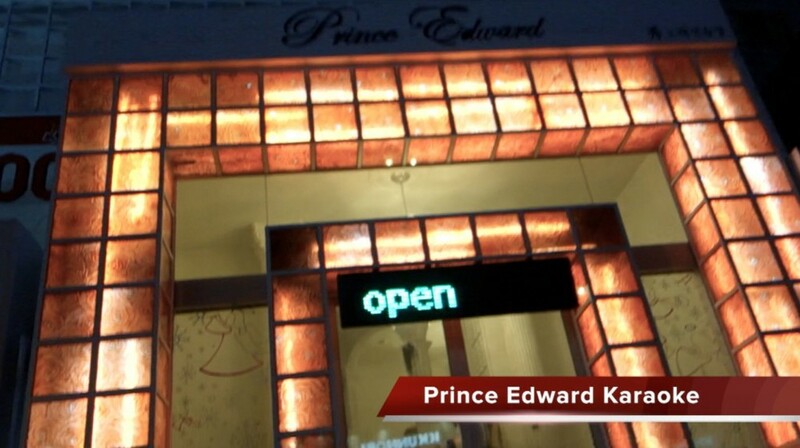 By the recommendation of the mystery magician--as appeared in KWOW episode 125, we are dropped off in front of Prince Edward Noraebang. Note #1: noraebang means karaoke. Note #2: Prince Edward is a real person. We walk up the black stairs to the main counter. The interior is white and inspired by the Greek and Roman classical architecture. The decorative columns are a bit tacky. Arrive drunk and you learn to appreciate them more. You pay first, then sing. We paid 25,000 won for one hour (approximately $25 USD), then as service were given an extra 30 minutes to sing! We started out in a small room. We lucked out and were moved to the VIP room, which was bigger and circular. Each room is embellished with floral wallpaper and has a stage with a spinning ball of lights. Open 24 hours. Rain or shine. Happy or depressed. Come anytime. One of the best karaoke spots I've been to, especially in terms of microphone and output. Your voice will sound clear and crisp. No fighting over the instrumental track! With the newer songs there is vocal backup. If you forget how to sing part of a song, the pre-recorded vocals will take over until you begin singing again. Every room has a mini stage with a spinning ball of lights. There's a rooftop terrace with views of Hongik University. Come at a time when it's not too busy and you just might score bonus minutes! 4:25 am. My friend and I are hungry. We see a shiny building and are attracted to its aluminum foily quality. As we walk closer to it, we learn it is a Japanese restaurant called Delicious Kyoto (맛있는 교토/Mashitneun Kyoto). Upon entering we immediately walk up a flight of stairs. We get excited from its interior design. On the right there are stairs that lead to a dark basement. Shelves are adorned with alcohol bottles. On the left is another set of stairs that led downwards to the main dining area. Unfortunately the restaurant is closed. What a tease. Entrance doors are open and potential customers walk in, only to be shooed away with the feeling of unfinished business. 4:29 am. We walk to another shiny building, which houses the Samguri Pocha (삼거리포차). The pub is owned by YG Entertainment's CEO Yang Hyun-suk. Come here enough and you just might bump into members from Big Bang. It's a pub so everyone around us drink. My bestie and I don't feel the pressure. Instead we secretly people-watch the other customers. We feel like we're watching scenes from a Korean drama. One woman has her face planted on the table while her friend dozes off with her chin rested on her swaying arm. A few tables away a party of eight men are gathered. They are rowdy. Between the two I choose to watch the drama with two drunk girls. What's their story? After briefly creating a plot in my mind, I resume to talking to my bestie. We share an egg stew which contains some mysterious-looking items in bottom. It's a bit salty. We prefer the seaweed soup. 5:17 am. We've always passed by multi-bangs (aka: multimedia rooms), however never been to one before. Time to explore some new territory. We head to MoPlay located on the 6th floor of the building across Luxury Su Noraebang (서교동 367-39 / 367-39 Seogyo-dong, Mapo-gu, Seoul). Pay upfront 25,000 won for two hours. You can watch a movie, listen to music, play games, surf the web and even indulge in cookies. Or maybe you just want to take a little nap. 7:35 am. We leave MoPlay and are totally pooped out. As we aimlessly walk the streets hoping to come across the nearest train station, we laugh at everything. Being delirious is like wearing a different pair of glasses.